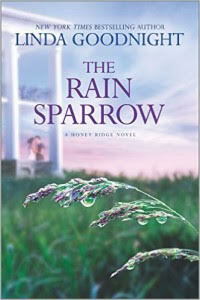 This book was to be a part of a blog tour in March but, due to a mix up, I did not receive it in time. You can read my spotlight of the book here. This was one of those books that sold me on the summary--it's a contemporary AND a historical romance, we have wounded characters, and there was the promise of a plucky child character. The combination may sound strange, but it actually worked quite well. To be fair, Carrie is not quite as meek as she seems in the summary. She is a woman who was hurt in the past and still dealing with those wounds. I felt that Goodnight's depiction of her was believable and I was able to relate to her. Hayden was more complex, but usually just as realistic. I wasn't convinced of his fear of mental illness, only because I didn't feel like Goodnight had really woven that detail fully into the fabric of the narrative. Carrie's and Hayden's relationship develops at a steady pace, which is sometimes a hard thing for a romance novel to achieve. Because people usually ask me, I will say that this is a clean romance, although it does deal with some other difficult topics, such as substance abuse and child abuse. The secondary story was a "dream" that Hayden had about people living in the area shortly after the Civil War. I found this plot to be incredibly interesting, enough so that I sometimes wish it had been its own book. It did take me a while to see how this plot fit in with the contemporary story but, eventually, it all came together. I enjoyed Goodnight's writing style, which is clear but still captures the different personalities of the characters. I do wish that she would have taken a bit more care to fully integrate some of the details, such as Hayden's fear of mental illness or Carrie's past heartbreak. But, I found that to only be a minor annoyance.. In the end, this was a sweet love story and one that I would recommend to anyone looking for such a book.